2.Corinthians 5:l-10 For we know that if our earthly house, this tent, is destroyed, we have a building from God, a house not made with hands, eternal in the heavens. For in this we groan, earnestly desiring to be clothed with our habitation which is from heaven, 3 if indeed, having been clothed, we shall not be found naked. For we who are in this tent groan, being burdened, not because we want to be unclothed, but further clothed, that mortality may be swallowed up by life. Now He who has prepared us for this very thing is God, who also has given us the Spirit as a guarantee. So we are always confident, knowing that while we are at home in the body we are absent from the Lord. For we walk by faith, not by sight. We are confident, yes, well pleased rather to be absent from the body and to be present with the Lord. Therefore we make it our aim, whether present or absent, to be well pleasing to Him. For we must all appear before the judgment seat of Christ, that each one may receive the things done in the body, according to what he has done, whether good or bad. It is good news to know that we as Christians will spend our future with the Lord. We can view death as being a step up or a victory. Paul, when referring to the conflict between a life of suffering on earth and the spreading of the gospel, in contrast to his desire to be with God in heaven, expressed himself in the following way (Philippians 1:21): For to me to live is Christ, and to die is gain. In Romans 8:18 he states: For I consider that the sufferings of this present time are not worthy to be compared with the glory which shall be revealed in us. There is hope for you! For what God has planned for your future, is no way close to compare with your best day here on earth. However, during the time that you are still here on earth, the best thing is to live everyday with joy and purpose and, at the same time, do not forget the wonderful future. 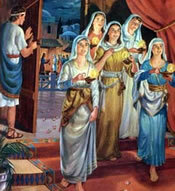 The five wise virgins kept themselves ready for the coming of the Lord. They were full of the Holy Ghost, living in obedience to God, in holiness and expectation.